This morning I went for advice from John and Mimi. We have been friends for 15-years, and they both know me very well. I had a misunderstanding with a person that I know and I wanted to get some feedback. I've just made an appointment with Mister Handyman to install my Yingli 250 watt solar panel on Box Van's roof. The guy from Mister Handyman phoned me and told that they would not do a job like mounting the Yingli solar panel. Too much legal risk. Tomorrow I plan to go the Home Depot in Lemon Grove where there are a bunch of guys from Mexico looking for work. I'll interview them to find out who knows something about using electric drill motors. 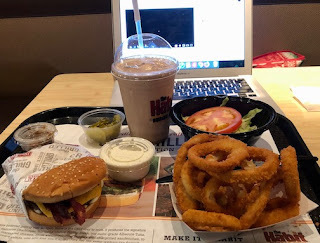 I'm at The Habit Burger Grill in the City of La Mesa. Their burgers! Gotta love 'em! I ordered a char-broiled cheeseburger with bacon! Onion rings. Chocolate shake with very light chocolate. A consignment lot will greatly increase its exposure to potential buyers, nice move. Thank you for your idea of a 2nd solar panel for bad weather times. A manual hand pump is no where on my horizon, Ed. I intend to use the attic for the location of my 26-gallon fresh water tank. Which, by-the-way, has been ordered. I plan to put Box Van's water heater in Granny's Attic. About insulation. My living quarters will be insulated. I am not planning to insulate the area outside of my living quarters [Workshop, Granny's Attic, etc]. George, Was thinking about your thoughts of putting your fresh water tank in the overhead compartment. How large of a tank are you considering? Water is heavy and a large tank may overload the structure of the box? On the other hand if the tank was up there you would not need a pump to get water to your sink / shower, etc. your system would be gravity pressurized! I already bought the tank. It's on its way here from Canada. It is a 26-gallon tank. This tank will weigh only 208 lbs when filled. Box Van was a U-Haul furniture truck rental. And has a gross capacity of 7-tons! Did you postpone having your propane tank installation? No. It is not postponed. The welding shop will phone me when they have time for the install. Hi George, What was the outcome of Scampy's hitch repair? I replaced the coupler myself. On that water tank install....up there it makes the rig even more top heavy and also it might be hard to fill it being that high. I do not believe that you understand that Box Van was a U-Haul furniture rental truck which carried furniture up there in Granny's Attic. It may be hard for you to fill the fresh water tank, David. It will be easy for me. Thank you for taking time to comment your concerns for my welfare.